I saw most of the city from a tour bus and did not like taking photos through the bus window. However, we did make a few stops and I took pictures there. I didn't have my camera when we walked through Pike Place Market or went up in the Space Needle, and I'm just stubborn enough to not like taking pictures with my phone. Seattle is a great city, beautifully situated with water all around and mountains on both sides. And there are lots of things to do and see. I'd love to go back sometime. 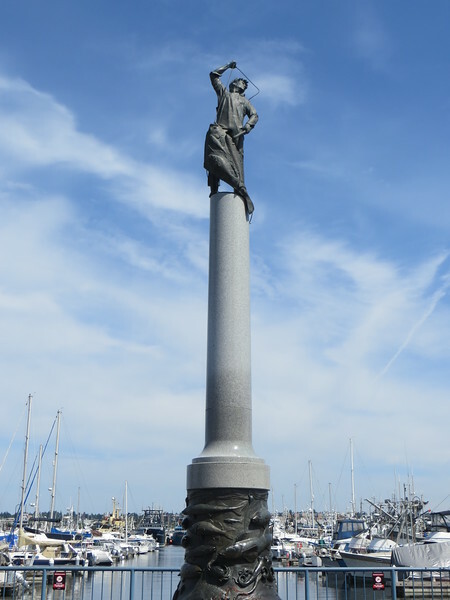 At the base of the piers is the Seattle Fishermen's Memorial, commemorating Seattle fishermen who have been lost at sea. On the first Sunday in May the ceremonial blessing of the fleet is held here.